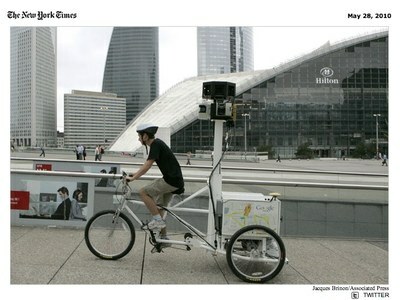 This is a photo of how Google collected some images for Google Maps Street View in Paris. Kind of an interesting mix of high and low tech. Saw this on CNN.com. There’s nothing cuter than a little kid on a snowboard. I was told by my snowboard instructor this past winter that they usually don’t start kids this early on snowboards because their heads are too big in relation to their bodies. It makes it harder for them to keep balance. But, this girl doesn’t have any problems with that. She looks more comfortable on a snowboard than I’ve ever been! 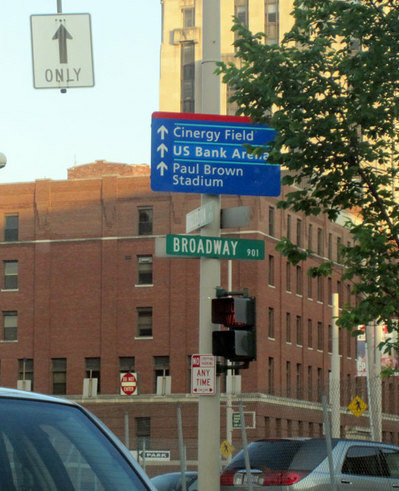 I hope someone doesn’t spend too much time trying to find Cinergy Field. I guess that there must be some city department that handles this type of thing. This is a case of vandalism as the owner was not involved in the painting over. This is really embarrassing to Cincinnati as it reinforces the perception or the reality that we’re not very accepting of new ideas. 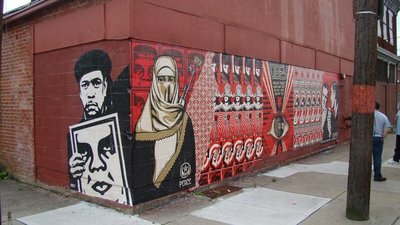 UPDATE: Here’s a picture of what the mural looked like before it was vandalized. 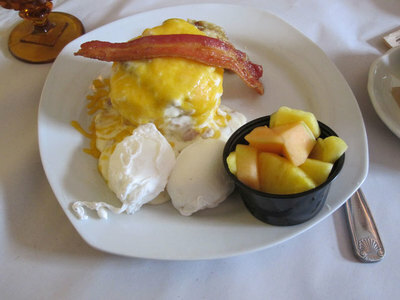 Virgil’s Cafe on Diners, Drive-ins and Dives tonight at 10PM Food Network. 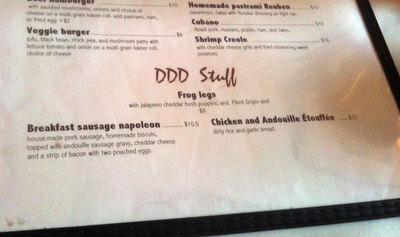 I was at Virgil’s Cafe in Bellevue last Sunday for brunch and tried the DDD Breakfast sausage napoleon. It was delicious! 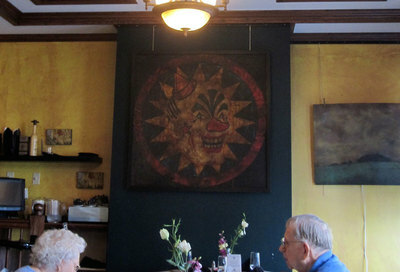 I noticed that since the last time I was there, the art on the walls had changed and the creepy clown painting was gone. 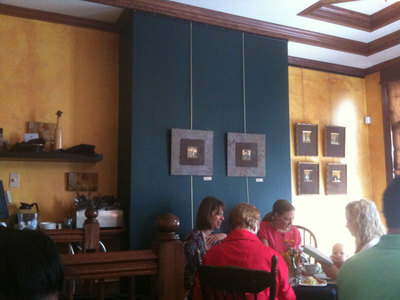 It was replaced with some smaller prints that I couldn’t quite make out from where I was sitting. Not really an improvement on the clown. Nice article on Reds’ rookie phenom Mike Leake. In the short time Leake’s been with the Reds, he’s become one of my favorite pitchers to watch. Leake doesn’t have overpowering stuff, but he’s got great control, mixes speeds, and challenges hitters. It’s just fun to watch. This is over in Covington, KY, 242 W. Pike St., in the middle of the Covington Arts District. Know what you’re getting into when you volunteer your building for artwork. 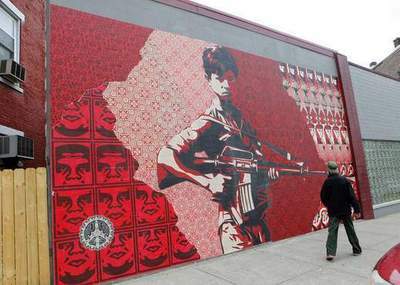 My first reaction was that Shepard Fairey probably should have chosen a more appropriate image if he knew that there was a school nearby. But, thinking about this more, is the image really offensive? Isn’t art supposed to provoke some kind of thought or discussion. Like, why is this Southeast Asian child carrying a gun? Painting over things won’t make issues in the world go a way. UPDATE: Here’s more information about the image, Duality of Humanity 4. Pro Series Tetherball. 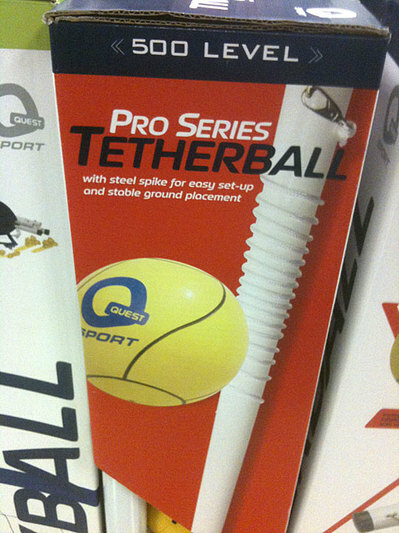 For kids that want to grow up and play professional tetherball. Bristol Palin, 19, is listed on the speaking group’s website as available for conferences, fundraisers, special events and holidays, as well as women’s, youth, abstinence and ”pro-life” programs. 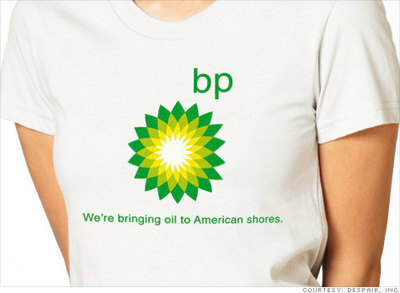 If there’s anything the Palin’s know how to do, it’s cashing in. Now you can have Bristol over the holidays speaking about how abstinence teen pregnancy pays!